Just another quick tip with which you may be familiar. If not, it’s very useful. As you probably know, holding the accent/tilde key down while dragging clips will “disable” clip connections temporarily. When you release the key, connections are enabled again. This tip shows you an easy, (and undocumented) way to “lock” connections off so you need not hold the key down. In lieu of actual interesting content, I wanted to share this just, uh… because. The job I was on today is one that I could basically come up with a slightly ridiculous idea and run with it. So I cut a spot with a grid overlay, some other generated grid lines moving around (thanks Simon!) multiple resized/retimed clips filling up the grid, piles of sfx, all comped over a BG clip. Not gonna win any awards, not terribly complicated in the grand scheme of things, and it may never see the light of day… but it was fun. What made it even more fun was the fact that I could assemble the giant pile of stuff below, and play and edit it in real time, full resolution, unrendered. Final Cut Pro 10.1 is here! Along with updates to Motion and Compressor! All are free updates. There’s a lot of info flooding out right now, and I’ll leave it to others to talk about all the cool new features and goodies in these updates. This, my little contribution to the deluge of information, is about updating your existing FCP 10.0.x work to version 10.1. There have been some major changes, good changes, to how FCP X organizes stuff, and I hope my post will help to explain it a little bit. And by ‘post’, I mean ‘novel’… It’s way longer than I thought it would be. But it’s really entertaining! With pictures and stuff! For the record, I’m not “certified” as anything, except maybe insane, as I started madly moving all my work into FCP 10.1 the second it appeared. I’ve cheerfully ignored the “don’t upgrade in mid-project” mantra, and updated all of my wildly varied Projects and Events. I am very tired. However, you’ll be happy to know that updating your work is really quite easy. Apple has a very good white paper on this process, and there are detailed instructions available via the Final Cut Pro 10.1 “Help” menu. What follows comes from my experiences when updating, and it’ll hopefully make it a little easier for you. I do suggest reading the official Apple info, just in case I’ve missed anything. Also, as you’ve no doubt heard, you will need to update to OS X Mavericks to run 10.1. A Word (ok, a lot of words) About Organization. 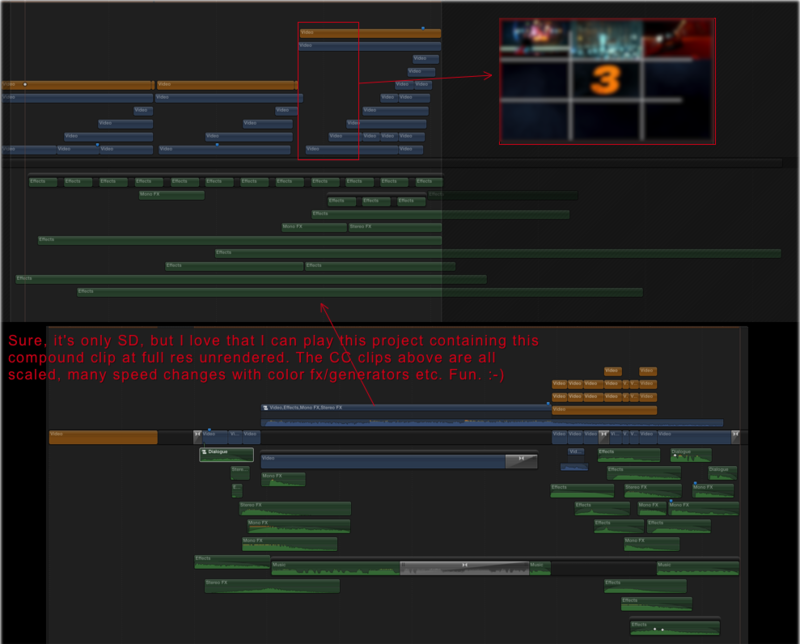 FCP 10.1 does away with this arcane method of organization and puts everything in Libraries. A 10.1 Library contains multiple Events and Projects in the same location. No more Project Library. To work with existing 10.0.x material, you need to convert (update) your associated Project(s) and Event(s), aka jobs, to Libraries. I’m pretty careful about keeping track of these associations, and I updated each of my nicely separate 10.0.x “jobs” one at a time to become individual 10.1 Libraries. I’ll explain how I updated below. But maybe you only have a few “jobs”. Or perhaps you’re not as OCD as me. You might not remember that at some point you created a Project associated with a particular Event, but you did. In this case, the best strategy, and the strategy Apple seems to favor, may be to update all your jobs at once. When it updates your jobs, FCP 10.1 will create a separate Library for each connected drive containing online (not hidden) FCP 10.0.x Projects and Events. So, by updating all your jobs/drives at once, you don’t have to figure out the associations beforehand. And there’s no need to hunt through Events for your projects when you’re done. When a Library is created by updating – even if you update multiple Events and Projects at once- the original Events will all appear in the new 10.1 Library. And your Projects – no matter which Event in the job they were associated with – will be put into one new Event (named “Updated Projects”) in this Library. What happens – more or less – is FCP 10.1 puts the contents of your old Project Library into this Event in the new 10.1 Library. Of course, everyone works differently. As I said, I have a lot of pretty well organized jobs on my disks. So I updated separate jobs on each disk, rather than everything on the disk. For more advanced users this may be an option. In FCP 10.0.x I use the now free Event Manager X (EMX) to create job sets that I can open and close separately. When I updated these jobs, I used EMX to do them one at a time. To be clear, it is not necessary to use EMX when updating. It made sense for me, because I already use it and it worked well for what I wanted to do. Each of my FCP 10.0.x jobs consists of Event(s), and associated Project Library folders (containing multiple Projects) with the same name as the Event(s) the Projects are associated with. The folders were all created in the FCP X Project Library, not in the Finder. All Projects associated with the Event(s) go in those named folders. I then use EMX to hide or open only the sets containing associated Projects and Events. My “jobs”. If that seems confusing, the picture on the left shows my Project and Event folders as they appear in the Finder. Only one “job” (ELYSIUM) is online, all other jobs are hidden (offline). My “jobs” can contain multiple Events and folders of Projects, but they’re all associated. I’ll touch on this stuff again below. In fact, there will be a lot of redundancy as I prattle on here. Sorry. By the way, all those job names are totally fake. I only cut home movies and YouTube cat videos in FCP X.
Again… if you’re less of a geek than I am, don’t have many “jobs”, or don’t really organize your stuff in any meaningful way, it’s probably best, and likely easier, to update everything at once. Having all your work online at the same time – and all of your drives connected – will result in fewer possible issues with unlinked media. FCP 10.1 will create one Library for each connected disk. If you use Disk Images to keep your jobs separate in 10.0.x, you’ll really like the update process. For example, if you have Project and Event folders on four connected drives (i.e. Macintosh HD, two Disk Images, and a Thunderbolt drive) You’ll end up with four corresponding Libraries. After you update you can then sort things into additional new Libraries you create, and/or to new Events or Keyword Collections within Libraries. I’ll get back to that below as well. If you’ve gotten this far without falling asleep, I’d suggest reading this whole post first before you do anything. It’ll be fun! Hopefully the process will then make sense, and you can decide which updating method, individually or all at once, you’re most comfortable with. Updating your work to 10.1 is easy, But I think doing a little organization first in 10.0.x. is a good thing. You don’t have to, but it helped me. If this all goes wrong, (it won’t), your Mac erupts in flames and the earth swallows you up. . .
It’s not my fault. This is a random, unofficial blog on the intertubes! The following advice is for entertainment purposes only!! Once you’re all organized, but before you install FCP 10.1, make backup copies of everything. This includes your old 10.0.x app itself (.zip it by Control Clicking it and choosing Compress…), all original Projects and Events, and even your Motion Templates folder just to be safe. If you back up to an attached drive, put all these copies inside a folder on that drive so FCP 10.1 won’t see them when you begin updating. You want your backups to remain unchanged. You can also remove all your preferences using Digital Rebellion’s Preference Manager if you want. For what it’s worth, all I did was back everything up, install the new apps and update my jobs. You should probably be more cautious than I am, but for me updating was a very straightforward, trouble-free process. For those of you who’ve been using Compound Clips as faux “projects”. . . In my opinion (which you are free to ignore) you might want to convert them to actual projects before you update your jobs to 10.1 Libraries. To do so, in FCP 10.0.x, take any sequences you’ve cut in CC’s that you plan on bringing into 10.1, edit them into new, empty projects, and break them apart. Any Compound Clips that are just used as Compound Clips (meaning those that are not projects that you’ve cut in CC’s to avoid the Project library) will be fine. And honestly, your “project” CC’s will be fine too. Like I said, this is just my opinion. If you’re cutting spots, shows, trailers… whatever, in CC’s instead of projects, I think you will be happier if you convert them to actual projects. Among other reasons, the great new ’snapshot’ feature only works for Projects. Also, as noted above, 10.1 puts updated projects in one place, CC’s will still be in their original Event(s) in the Library after updating. Not a big deal, but… inconvenient. To be perfectly clear, this isn’t required at all, it’s just my preference. If you don’t do it first, you can always do it anytime after you update your 10.0.x “jobs” to Libraries. Or not at all. Nothing will get screwed up if you don’t. Alright, enough editorializing. . . If you’ve trashed your old preferences during your backups and preparation, make sure everything is set correctly after you install 10.1. Particularly the FCP X “Media Storage” preference (Copy to Library or Leave in Place). Again, not required, just a suggestion. I use shared media, so I leave files in place. The steps below (there really are steps below, honest!) will work whether you have your original media stored in your Events, or externally linked. Just to redundantly reiterate what will be going on. . . when you choose the “Update Projects and Events” command and select an option, FCP 10.1 will make a new Library from each available set of Event/Project folders it sees on every connected, mounted drive. 1 drive = 1 Library, 2 drives = 2 Libraries, etc. You can also navigate to specific Folders, disks or SAN locations which contain 10.0.x Event and Project folders and update those “jobs” individually. During the update, 10.1 will move media to the new Library, but it does not duplicate or delete any media. So, even if the update process takes a while, don’t worry about that. If you have Original Media in your 10.0.x Event it will be moved (not duplicated) to the new Library. If you use linked (shared) media, it will stay in place wherever it is, only the links will be moved to the new Library. Painless. Be aware that for each “job” or set you update, it is important that you have all the Events associated with your Projects in each “job” or set online. If a Project references Events on other volumes, just be sure they’re all online when you update. The same holds true if you’re updating everything at once, with EMX, manually locating, or by mounting disks or SAN locations. If you do have Projects – or Compound or Multicam Clips in your Projects – that don’t have the associated Events they’re linked to online when you update the set… you’re going to need to spend some time re-linking stuff. It’s not a big deal but it is kind of annoying. I learned this the hard way. If, for some reason, you don’t know how to relink, simply choose “Relink Files…” from the File Menu, and let X find, (or point X to) the offline items it lists. I think it’s better to take your time before you start so you don’t have to do this though. To tell the truth, everything I’ve written so far is basically just to prevent you from updating and ending up with a bunch of offline media in your shiny new Libraries. That, at least in my experience, is the worst thing that will happen. The update process is pretty much idiot-proof. I was actively trying to screw it up at times (I made good backups first!) and all my work survived. The next section talks a little about preparing your jobs for updating with the help of EMX. If you don’t plan on using EMX – if you have any qualms at all about EMX – just skip to the actual steps that follow. If you don’t have it, get the latest version of EMX. You can create job sets, and then load and update each individual EMX set to create individual 10.1 Libraries. Advanced users can create, load, and update individual job sets manually, but it can become complicated. EMX simplifies this process. If you’re at all confused by EMX or the individual job update method, I recommend updating all your work at once. As you’ll see later, it’s very easy to reorganize it after updating. I made all my EMX Sets before I installed FCP 10.1. Then, after installing 10.1, I used EMX to load individual job Sets for updating. You can make Sets after you install 10.1. Just don’t choose “Update Projects and Events…” from the FCP “File” Menu until you’re done preparing your EMX job Sets, as each time you update a set, the original Project and Event folders will no longer be available to EMX. — In EMX, create sets of your 10.0.x Events and their associated Projects. Click the pic below for a bigger version. If in doubt, detailed instructions are in the EMX help. 3-Name your job set and click ‘OK’. Repeat Steps 1-3 for each Set you’d like to create. Note: If FCP X is open when you click the “Move…” button, X will quit. Don’t worry about it. All backed up? Have you read all the documentation? EMX users have your sets all ready? Good! Install your new apps and let’s update stuff! 1- Open FCP X. Don’t worry, 10.1 will not update anything until you tell it to. The first time it opens, it will create a new default Library. It might ask where you want to save it, I honestly don’t remember. The new Library will contain an empty, date stamped Event. FCP 10.1 requires that at least one Event exist in a Library, you can’t have an “empty” Library. Leave that Library alone for now, you can delete it or use it later. 2- In the FCP X “File” menu, click the “Update Projects and Events…” command. A dialog box will appear. If you have an EMX set loaded – or have jobs in your local Project and Event folders and/or on connected disks that you’d like to update all at once – select “Update All”. Alternately, you can “Locate” (point FCP X to) specific Disks, Folders or SAN Locations to update them individually. The dialog explains it well, and the “Learn more…” link provides much greater detail if you need it. Whatever option you pick, FCP X will then create a new Library for each connected disk or specified location. Each Library will be named “(location name)’s Projects and Events”. In this Library will be all the Events that were present in each 10.0.x “job” set (whatever was online or you had Located), as well as an “Updated Projects” Event. If you had your Projects sorted into sub folders in the old Project Library, they’ll still be nicely sorted in Keyword Collections in the new 10.1 Library. When it finishes updating, you will be prompted to save or discard the originals. I suggest saving them ’til you’re comfortable with the update process. If saved, 10.1 moves your original Event and Project folders into a new folder it creates (in the same location as the originals) called “(location name)’s Old Final Cut Projects and Events” should you need to access them for whatever reason. If not saved they will be moved to the trash. Make sure everything came over as expected. You can then rename the new Library and any Events and/or Keyword Collections it contains if you’d like. If you have more individual jobs you’d like to update, proceed to step 3 (using EMX) or 3A (Manual Updates). 3- If you’re using the Event Manager method, quit FCP X (Not really necessary, but EMX does this automatically when you choose Move Events and Projects as it’s designed for FCP 10.0). 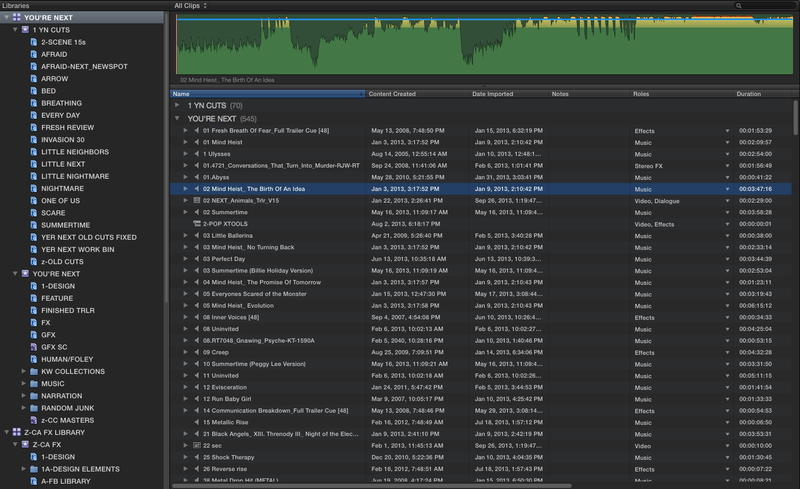 Then, Select and Move the next set of Events and Projects, re-open FCP X, choose “Update All”, and repeat ’til done. 3A- If you’re not using EMX, and you’re updating individual “jobs” manually, you need not quit FCP X for each job set you update. Just create additional new “job” sets and ‘Locate’ them (see below), or mount additional disks or SAN locations, and choose “Update All” for each “job” you bring online. A little tip for those who manually hide and load jobs. If you have folders or “offline” locations containing jobs you’d like to update, just stick your job folder pairs (Projects and Events) in properly named parent folders, then “Locate” each in turn to create individual Libraries. This trick also works if you missed a job while updating, or need to update an old, archived 10.0.x job or something. That was easy wasn’t it? 🙂 The great thing about Libraries in 10.1, is that by design, they always contain every bit of media needed for the projects within them. If you cut a clip from an Event in one Library into a Project in another, it copies the clip, (or the link to the clip if you leave media in place) into that Library. No more dependencies. Very nice. So… You’ll end up with one or more nice, organized Libraries full of Events and Projects. Now what? Other than Projects and Events now being in the same place, the way you organize things in 10.1 is similar to previous versions. Events function more or less the same as before. You can make as many Events as you’d like in a Library. You can move clips/media, or copy/duplicate collections and other metadata between different Events within a Library. Projects in 10.1 are also pretty much the same. Personally, I keep all Projects in their own Event in each Library, and organize them in there, but you can put them anywhere in the Library you want. The biggest new Project-related feature is Snapshots. Simply stated, a Snapshot creates a date-stamped duplicate of a selected Project. But, it’s better than a duplicate because… If you have Compound Clips or Multicam Clips in the Project, it makes them self contained. They no longer refer to the original Compound or Multicam clip parent clip – they now only exist in the Snapshot. You can of course still edit them, break ’em apart, whatever… but doing so will have no effect on any other Compound or Multicam Clips. It’s a really nice feature. Remember though, if you choose to duplicate a Project rather than make a Snapshot, any Compound or Multicam Clips it contains still refer back to a parent as in previous versions of FCP X. Either way, duplicated normally or as Snapshots, Projects in a Library now share render files. In 10.1 you can also delete Render Files from multiple selected Projects at once, as well as from multiple selected Events in a Library. Nice. Libraries essentially act like individual mounted Disks or SAN Locations did in previous versions of FCP X. You can copy and move things between separate Libraries. Anything you drag and drop from one Library to another gets copied to the target. All the necessary media (original clips or links to shared media depending on your prefs), Keywords, Keyword Collections, etc will come with it. You can Move Events from one Library to another as well, with the Edit Menu “Move…” command. Remember though, you have to have at least one Event in a Library, so you can’t Move all the Events from one Library to another. You can have multiple Libraries open at once, and open and close them with a normal “Open…” command. Finally! Also, if you hold the “Option” key down while launching FCP 10.1 an “Open Library” chooser will appear. In addition, Clicking and holding the FCP X dock icon will let you select and open recent Libraries. If you want to easily share Project(s) or Event(s), then moving or copying material between multiple Libraries is straightforward. With a “source” Library open, create a New Library. New Libraries will, by default, contain one empty date stamped Event. Rename it and/or add new Events etc as you see fit. To COPY items and leave the source Library unchanged, select whatever you’d like, and use the “Copy (item) to Library…” Edit Menu command. (“item” changes depending on what you’ve selected). Or just drag whatever you’d like, individual Projects, Events etc. from the source Library into the new Library. Events can be dropped onto the target Library to copy them. Other items, individual clips, projects etc, must be dragged to an Event in the target Library – don’t try to drag them directly to a Keyword Collection. Selected items will be copied to the target Library. All your Keywords and everything else needed will come with them. Linked media will stay where it is, Original Media contained in the source Library will be duplicated into the Target Library. The source Library will not be modified. Everything will remain in place unless you choose to delete it from within the source Library. To MOVE items out of the source Library to another Library, select whatever you’d like, and use the “Move (item) to Library…” Edit Menu command. (again, “item” changes depending on what you’ve selected) You can’t move items via drag and drop, you must use the Edit Menu command. Selected items will be moved to the target Library. All your Keywords and everything else needed will come with it. Linked media will stay where it is, Original Media contained in the source Library will be moved into the Target Library. The source Library will be modified. Everything you moved from the source will… uh… be moved. SAN Locations, Disk Images etc will work as before if you want to store Libraries on them, but you no longer need to use them to open and close jobs. No more mounting / un-mounting nonsense. You just open and close Libraries in FCP 10.1 like any other file. Hopefully this basic, slightly rambling overview will help you get moved to 10.1. 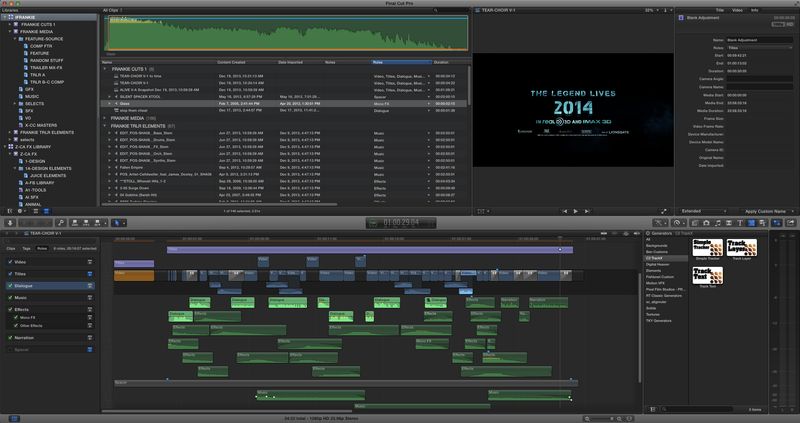 The FCP X team has done a great job of making it a really painless transition. And with Libraries, collaboration is now really simple. The 10.1 user interface is not wildly different, but the app is a lot better. It has some important fixes, updates and cool new features. One of my favorites is the new keyframe behavior. Try it! Some menus are new, revised and/or rearranged… so poke around in the app and check out the differences as some things have moved. A million articles will soon appear to detail all the goodies. Just for laughs, here’s a couple shots of my screen after updating. All my work is still there. 🙂 Have fun!